Last week, for Valentine’s Day, we shared a game called “Chase My Heart”. We knew people would like it, but after reading through a bunch of Facebook comments it turns out students and teachers both LOVED it! The gameplay for Chase My Heart was based off of a recent game that we released to members of Teach Piano Today’s PianoGameClub and the excitement that Chase My Heart brought to so many studios is a mere sampling of the fun that PianoGameClub members bring to their studios each and every week. 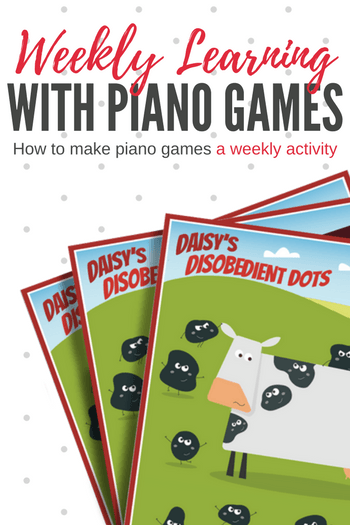 So, if you’re considering making game-based learning a weekly experience, you can check out February’s games from PianoGameclub below and see if a membership might be just what you need! With PianoGameClub, we take “dare to be different” very seriously. We don’t just want to send our teachers a “fun activity”… we want to send them beautifully illustrated games that will grab the attention of their students, strategic games that incorporate enough of a challenge to keep students engaged, and hilarious concepts that will make you giggle (or maybe even snort coffee out your nose!). In February’s game set theory will be a blast as a cow’s disobedient dots, a distressed digger, a hippo with good hygiene and a trio of teetering trunks bring fun to interval ear training, keyboard awareness, arpeggios, and half steps and whole steps. With a PianoGameClub membership you’ll be able to easily make game-based learning a weekly experience for your piano students as you’ll have the perfect game with every theory and ear training concept they encounter in their method books. No more searching online for hours… we’ve done all the work for you! If you’re not already a member of PianoGameClub and want to kick your theory teaching up a notch, click on the image below to preview the four games our PianoGameClub members are receiving this February. Then, If you like what you see and want to become a member, visit PianoGameClub here to sign up today for just $8 monthly. Note: These games are available until February 28th, 2018 only.